It is easy for us to get focused on the data and technology that make up a large part of how we serve our clients… but here at Utopia, we also have a strong passion for serving the communities in which we live and work. Utopia employees, across all regions, are passionate about volunteering and philanthropic initiatives and welcome the opportunity to get involved in causes for the greater good. Throughout the year Utopia’s employees volunteer in their communities for various organizations. In Bangalore, employees volunteer at The Rainbow Home, a long-term housing establishment providing a place of security for vulnerable girls on the street. Utopia employees help purchase groceries, assist with the yearly tuition, and tutor students in Math and English. Bangalore, which was once called “The Garden City”, has now turned into a bustling center of India’s information technology and has been renamed India’s Silicon Valley. This change has sparked a lot of initiatives to bring the greenery back to the city. Utopia employees took this opportunity to protect the environment and adding value by reducing the carbon level of pollution, which has been increasing at an alarming rate. 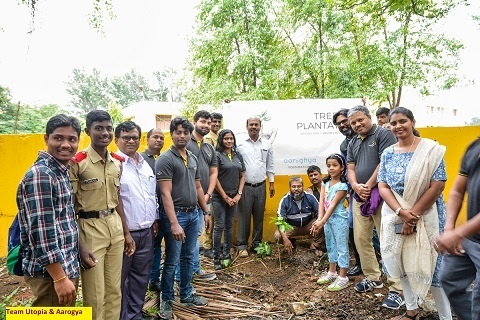 Employees gathered to plant 340 saplings in, and around, Bangalore. Utopia’s 2018 Joy of Giving season is upon us, and we look forward to sharing more stories of Utopia’s involvement in our communities and with organizations around the world.